I know there exist small and silent computers, but I really didn’t need something heavy. The files to access is placed on a Synology 212j NAS box. It is almost silent, and is placed in a closet in our home. A Raspberry Pi was perfect: It is super cheap, it is dead silent, and is almost not getting warm. Then I connected the SD card reader (USB), and after the card was auto detected, I ran df -h to see which mount point it had. The FAT32 partition was mounted on /dev/sdd1. I then made as mistake. I needed to umount the card, and I did so with the eject button in Nautilus (the default file manager in Ubuntu). It looks like it is unmounted, but it isn’t completely disconnected. It didn’t show up with df -h, but using dd in the next step gave some errors indicating the resource was busy. After some fiddling, I realized that I needed to unmount using the good old umount tool from command line. I have always thought that the eject button did exactly this, but I was wrong. A last sync command to make sure something buffered data hadn’t made its way to the card, and I was ready to test the good stuff! 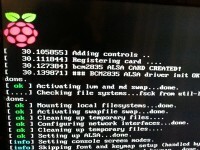 I inserted the card to the card slot of my Pi, connected to the TV using HDMI, and booted. And suddenly nothing happened… After some testing I found out that Raspbian was using the composite output, and not HDMI, as default. This can be changed in the X server config, but I didn’t care. All I needed was to make it running, install ssh, and the rest could be done from a regular computer. 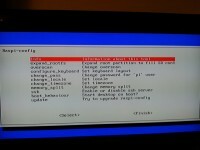 Although the image was blurry, I couldn’t care less when I saw the boot log on the screen. 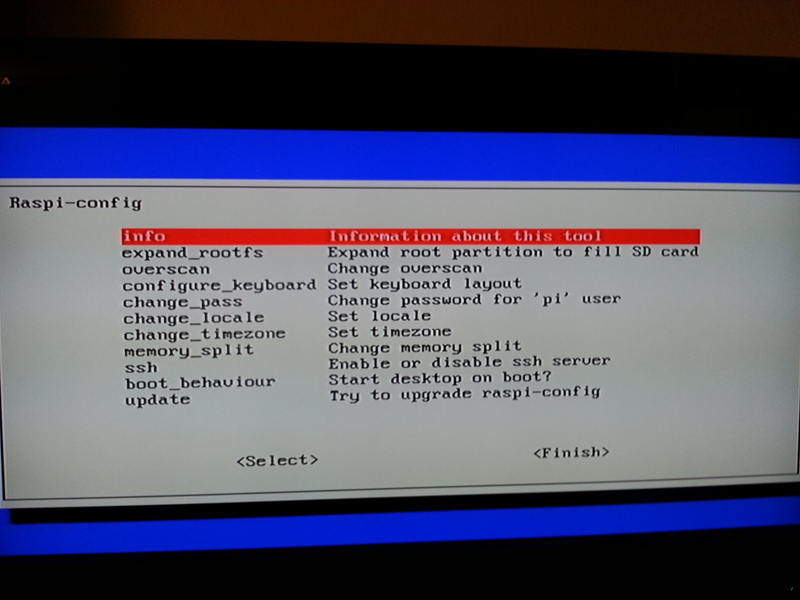 After booting, you are met with the Raspbian config tool. Only a few very central config steps were needed, and it all took just a couple of minutes. It also increased the root partition (after I had chosen to do so) to use the rest of the SD card. Voila! I could do the rest of the setup from my laptop. I will write more about the last steps of my setup in the next post.